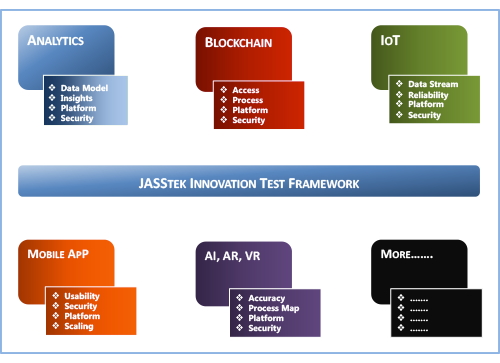 JASStek’s innovation testing framework enables our customers to test their technology, process and customer experience across multiple platforms. Assortment, Usability, Ease of navigation, Focus areas, Attention spans, Mobile displays, etc. Stress, Load, interface, combability, performance, security, combability testing, etc. Journey maps, Continuity, Visit to sale conversation, Marketing analytics, Process improvement, etc. Product design, Automation, Driverless car, 3D manufacturing, IoT, Infrastructure, Hardware, safety, etc. Managed Testing Services (onsite, offsite), Consulting engagements, Custom SLA. Contact today, for conversation with our Test Solutions Architect, to help you reinvent your business.